Students in Spanish II discussed the origins of Carnival, how it relates to Mardi Gras, and the different ways these holidays are celebrated throughout the world. In particular, they focused on the Carnaval de Baranquila of Colombia, which is one of the largest festivals of dance and cultural pageantry in Latin America. After the discussion, students made Carnival masks while watching videos of the dancing parades in Colombia. 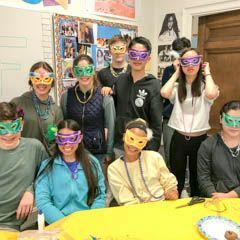 The World Language Department celebrated three cultural traditions — Mardi Gras, Carnival, and Chinese New Year — representative of the three languages taught at Crystal: French, Spanish, and Mandarin. The rich heritage of each culture is united and overlaps at this wonderful time of year. Students enjoyed craft making, tea tasting, crepe samples and other seasonal foods.